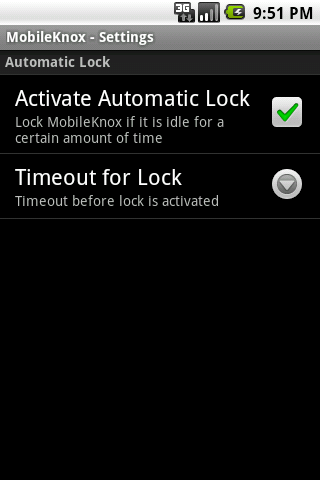 The automatic lock for MobileKnox is finished. If MobileKnox is unused for a certain amount of time access to sensitive data stored in it is restricted by an automatic locking mechanism. To regain access to MobileKnox the master password must be entered. 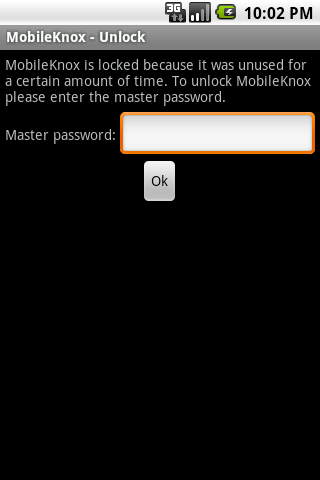 The following picture shows the screen that asks for the master password in order to unlock MobileKnox. The automatic locking mechanism can be configured as shown in the subsequently listed picture. Besides enabling and disabling the automatic lock the amount of time that must elapse before the lock is activated can be configured. A brief preview will show you the current state of the work. Screen 1 shows you the login screen. The list of the categories and the menu are shown in Screen 2. In Screen 3, an entry is displayed. The highlighting of urls is shown in combination with the menu. We are looking for skilled beta-testers. So, please feel free to drop me an email at support@mobileknox.com if you like to participate in our beta program.